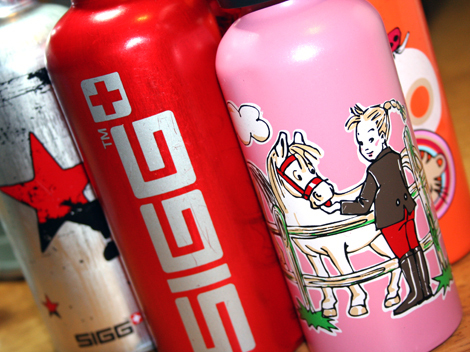 Oh SIGG, oh SIGG...not you too! I stumbled upon this letter, I'm sure many of you have read it by now. It's new news to me and worth while sharing with you my faithful peeps. Monday I'll be calling the local store that I purchased them from to see if they will do a voluntary exchange, but if not I'm mailing all 5 bottles out for replacements. Should you choose to do the same the deadline is set for October 31, 2009 and SIGG is not picking up the tab for shipping. I think Canada Post is going to love this recall. I chose not to send mine back. The fact that Sigg isn't willing to pay for shipping, the fact that they have known about the BPA leaching for two years before announcing are two good reasons that I no longer want to own anything put out by that company. I bought the boys a stainless steet bottle from crocodile creek instead. product and then fesses up a couple of years later. Argh!